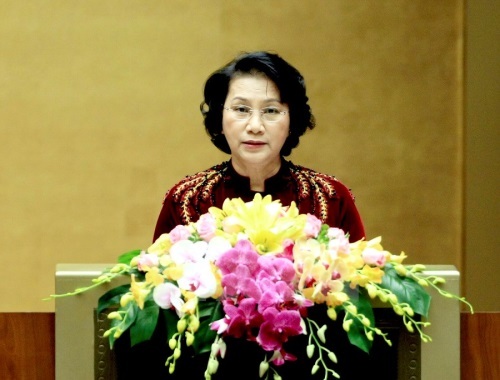 Over the past 71 years, standing side by side with the nation as the supreme representative agency of the People and the most powerful state organ of the Socialist Republic of Vietnam, the National Assembly has ceaselessly grown and matured, contributing significantly to the national liberation cause as well as the present cause of national construction and defence. Grasping the Party viewpoint on Homeland protection and regarding this one of the pivotal tasks, with high responsibility to the nation, since its inception, the National Assembly of Vietnam has issued 5 Constitutions, namely the 1946 Constitution, The 1959 Constitution, The 1980 Constitution, The 1992 Constitution and The 2013 Constitution, consistently affirming that Homeland protection is the cause of all people in which armed forces play the key role. Institutionalizing the articles of the Constitutions, the National Assembly has promulgated hundreds of laws in all aspects, clearly stipulating the rights and responsibilities of sectors, levels, organizations and citizens for national defense, and creating firm basis for building a strong all people’s defense. Under the leadership of the Communist Party of Vietnam, the management of the State and the support of the NA, the Vietnamese People’s Army has ceaselessly grown and matured. It has always been politically steadfast, absolutely loyal to the leadership of the Party, ready to fight and sacrifice for national independence and freedom and the happiness of the People. It has truly become a loyal and reliable political force of the Party, State and People; successfully accomplished the task of protecting the Homeland and the socialist law – governed State. Accompanying with the NA, the armed forces have made positive contributions to its development and maturity. Leaders and commanders at all levels of the armed forces have successfully organized the elections of deputies to the NA and People’s Councils at all levels in their units, thereby respecting the right to vote and the right to nominate of cadres and soldiers in the armed forces in accordance with the Constitution and law. In each term of the NA, representatives of the armed forces make up a sizable percentage of the NA deputies. They have made practical contributions to the NA operations, contributing to the overall achievements of the NA in fulfilling its legislative right, supreme supervision, and deciding important matters of the country. Grasping and seriously adhering to the principle of “the Party exercises the absolute and comprehensively direct leadership over the cause of Homeland protection”, and being consistent with the aim of “firmly protecting the independence, sovereignty, unity and territorial integrity of the country; protecting the Party, State people and socialist regime; protecting the cause of renewal, industrialization and modernization; protecting the national interests, political security, social safety and order and the culture; maintaining the political stability and peaceful environment for the country’s construction and development in light of socialist orientation”, Vietnam’s NA has paid much attention to the construction and perfection of laws on all people’s defence, creating solid legal foundation for building the Army of “revolutionary, regular, seasoned, increasingly modern…, the key force in implementing defence task.” In this spirit, the NA has passed a number of laws relating to defense, particularly to the building of people’s armed forces, such as: the Law on National Defence, the amendments and supplements to several articles of the Law on the VPA Officers, the amendments and supplements to several articles of the Law on Military Service, the Law on National Security, the Law on the People’s Public Security, the Law on National Border, the Law on Self Defence and Militia Force, etc. The Standing Committee of the National Assembly has enacted a series of national defense decrees, for example, the Decree on the Maritime Police, the Decree on the Intelligence, the Decree on the Border Guard, the Decree on National Defense Mobilization and the Decree on Defense Industry. To date, the legal system on national defence and security has been accomplished, meeting the demand of Homeland protection in the new situation. This is the legal basis for the Government to issue policies on national defense, Army building and Army’s personnel family, plans for defense mobilization; organization and direction over the implementation of defense tasks and necessary measures for Homeland protection. Inheriting, promoting the legislative achievements of the previous terms, the XIV term of the NA will continue to renovate, enhance the quality of building and accomplishing legal system in general. In particular, it will attach importance to reviewing and accomplishing legal articles relating to national defence and security in order to further meet the requirements of building a law-governed socialist state, socialist oriented and internationally integrated market economy. Accordingly, the NA will regularly screen, supplement and promulgate the system of legal document on defence to be relevant to the circumstances and requirements of Homeland protection in the new situation. Meanwhile, it will create legal corridor for building a strong all people’s defence to institutionalize the Party’s viewpoint on “protecting the Homeland”; “resolutely, persistently, and firmly protecting the independence, sovereignty, unity, territorial integrity of the country, maintaining the peaceful and stable environment for the country development”. Regularly attach importance to and improve the quality and effectiveness of legal dissemination and education to make cadres and soldiers fully aware that: the Constitution is the fundamental law of the Socialist Republic of Vietnam, and the supreme legal document. All actions violating the Constitution must be punished. Implementing and protecting the Constitution is the right and also the responsibility and the sacred task of each Vietnamese citizen. Thereby, building the spirit of “Constitution above”, “Law above” for troops; meanwhile grasp that: the mission of Homeland protection is the sacred and major one of the whole Party, people and troops in which People’s Army is the core force. In any circumstances and conditions, the People’s Army must be absolutely loyal to the Homeland, the People, the Party and the State; strive to successfully fulfill the mission of protecting independence, sovereignty, unity and territorial integrity of the country. The Army must be the vanguard, exemplary and pioneer force in implementing and protecting the Constitution, law and Military disciplines; be active in disseminating legal information and persuading people to follow the Constitution and law, particularly articles relating to national defense and security, thereby raising people’s sense of responsibility for Homeland protection. First and foremost, cadres and soldiers should strive to fulfill their functions of being an army for fight, for work, and for production, deserving to be “Uncle Ho’s soldier” and the affection of the Party, State and people. Party committees and commanders at all levels in the Army should regularly conduct thorough implementation of ideological work and actively grasp confession, aspiration, family situation, and living standard of troops, particularly those serving in units stationed in border and island areas. They should also acknowledge difficulties in carrying out mission, the shortcomings in following law in general and those relating to national defence and security in particular and timely report to the NA deputies and its bodies so that the NA can have adjustments and supplements to the laws and decrees on policies for the armed forces’ personnel to make them relevant to the reality. Army units should regularly coordinate closely with NA delegations and local party committees and authorities to hold meeting with voters, particularly voters in the Army so that NA deputies keep close links with cadres and soldiers of the armed forces and grasp their confession and aspiration as well as their suggestions to the NA; timely brief the results of the NA operation after each session and make favorable conditions for cadres and soldiers to contribute to building the NA truly the highest representative organ of people and the most powerful state body.